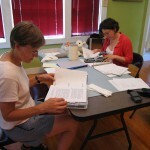 A small but enthusiastic group of volunteers has been addressing many issues critical to the long-term preservation of the three buildings and their collections. 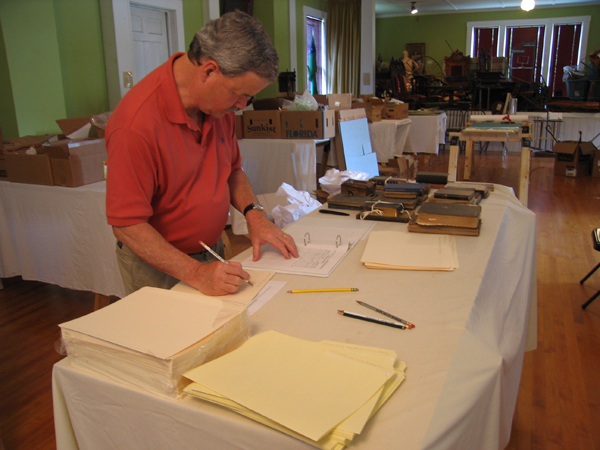 In 2004 The Society obtained a CAP grant from the Institute of Museum and Library Services to have the three buildings and their collections assessed as to preservation condition. 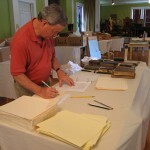 The preservation Architect Tom Keefe, of Keefe and Wesner Architects, P.C., and independent conservator M.J. Davis looked very carefully at buildings and collections respectively and gave us detailed, prioritized reports. The reports showed that because of issues of temperature, relative humidity and light, the Victorian Schoolhouse was the best preservation environment for the collections. 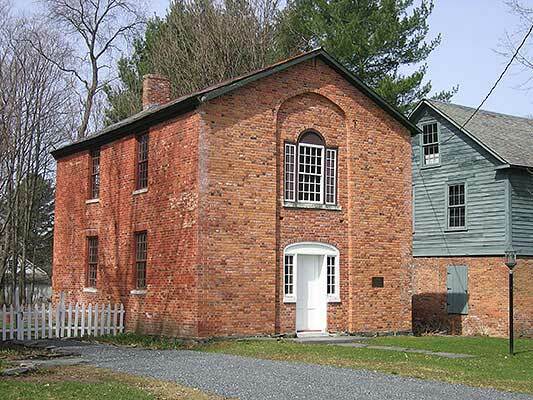 Accordingly, in the spring of 2005 all of the artifacts in the Melodeon Factory were moved to the second floor of the Victorian Schoolhouse under the direction of Mary Lou Willits, former Executive Director of the Slate Valley Museum in Granville, New York. We have begun a multi-year process to identify, describe, photograph, accession, house and store thousands of artifacts never before listed. As part of this process, through grants from the Costume Society of America and the Hills and Hollows Fund, Curator Margaret Spicer from Dartmouth College and M.J. Davis helped us look at our costumes and textiles to identify them and make accessioning and storage decisions. During our work we discovered numerous photographs, postcards and glass plate negatives which we continue to catalogue and scan, many of which are available on this website. Meanwhile, a committee on buildings was studying Tom Keefe’s report, prioritizing, assessing costs and developing a 5-year plan to accomplish the work in manageable pieces. The Union Academy was in the best shape, since extensive restoration work had been accomplished in the 1980’s. In addition to identified work necessary at the Victorian Schoolhouse, the preservation environment would have to be improved. As these plans were being made, the south wall of the Melodeon Factory suffered a catastrophic failure in May of 2006. With the help of contractor Querrey Industrial and engineer Mark Atwood of Ground-Up Engineering, the building was shored up for the winter and a program of surveying and assessing begun. It became clear that the building would require a drainage system, a below-frost foundation and extensive masonry repair accomplished while the second floor was raised. The magnitude of the Melodeon Factory problem far exceeded the scope of the original piecemeal plan for the three buildings. It was therefore decided that the best approach would be to address the needs of all three building as part of a total fund-raising effort. Extensive preservation and restoration work at the Melodeon Factory was completed during 2008. This work was made possible through funding from individuals, the Town of Poultney, the Vermont Housing and Conservation Board, the Vermont Community Foundation and the Hills and Hollows Fund. At the East Poultney Schoolhouse (1896), through a Cultural Facilities Grant from the Vermont Arts Council, the Society has improved the preservation environment by laying down a vapor barrier and putting in a new furnace. Electrical wiring was modernized as well, making possible full accessibility through the eventual installation of an elevator to the first and second floors. 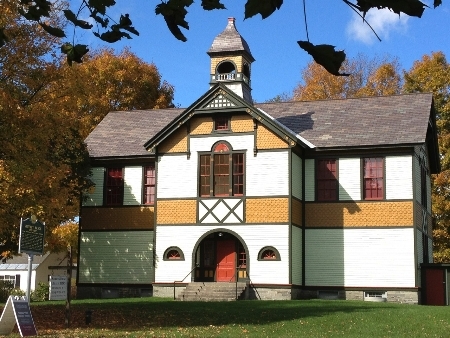 The Schoolhouse was finally restored to its original paint color scheme in 2012 with a grant from Preservation Trust of Vermont. Leonard Spencer of Cabot VT determined the colors from old photographs and paint analysis, and designed the stunning scheme of the Queen Anne period, adding red touches from the belfry to the front door. Luxbrush Painting Co. of Manchester VT, under the expert direction of Kris Keubler, repaired and painted the building so that it almost looks brand new. 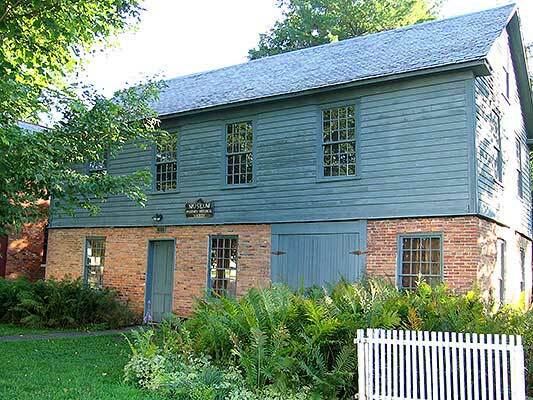 All three buildings, along with selected exhibits, are now available to the public during the months of July through September on Sundays from 1 PM to 4 PM and by appointment. To schedule an appointment, send a message to [email protected].